My friends at Crown & Covenant are aware of one of every niche blogger’s Achilles’ heels: free review copies. Over the past two years they’ve sent me several books and CDs to feature on URC Psalmody, and I’m always more than happy to do so. The only problem is that they’re the only publishing company that currently offers me this incentive, which means my reviews are not as well-balanced as they could be! Nonetheless, since I may be waiting a long time for Reformation Heritage or P&R to add their contributions, I’ll happily continue to review C&C resources. Over the past several years Crown & Covenant has published a series of albums with simple recordings of psalms from The Book of Psalms for Worship. Currently twelve such albums exist (if my count is correct), and more are expected to appear in the coming months. The most recent is Solace, a collection of twenty psalm settings that focus on the Lord as a source of protection and strength in times of trouble. Utilizing multi-track recording technology, Solace was produced by three members of a very musical Reformed Presbyterian family in California who recorded over their own voices to create the auditory illusion of a small choir. I’ve had the privilege of getting to know this family a little bit and can attest to their love for psalm-singing, as well as their skill in doing it. Recording twenty psalm settings at professional quality for commercial distribution is no easy task! And overall, this is a recording worthy of the long heritage of psalm-singing that Reformed and Presbyterian churches have enjoyed. The primary use I would have in mind for this album would be a reference recording. That is, I would go to Solace mostly to find out how an unfamiliar tune goes or to explore possible tempi, arrangements, etc. Because most of the arrangements are very simple, Solace would be especially helpful for those seeking familiarity with The Book of Psalms for Worship or a cappella psalm-singing in general. But the recording quality is generally good enough that the album could make for enjoyable listening music as well, particularly in the area of personal devotions. Again, the simple singing style makes it almost impossible not to meditate on the words as they are sung. Some aspects of Solace are not as aesthetically pleasing as they could be. The multi-track recording can sound too manipulated at times, especially the female vocals. And, to return to one of my typical complaints about many kinds of psalm-singing, I would love to hear a little more variety in the pacing and dynamics of some of the psalms. In general, I always prefer real-time recordings like those of the Syracuse RP Church, also in this series, which are excellent. Still, Solace and this series in general set a high standard for psalm-singing albums of all kinds. The closest comparison I can make to a series from the CRC/URC tradition would be Dordt College’s Be Thou Exalted, LORD! series from the 1980’s. As we look ahead to the publication of a new Psalter Hymnal, the OPC and URC’s talented musicians and singers ought to give careful thought to producing a similar set of recordings. Singing the psalms does not need to be beautiful in order to be worshipful, but it certainly deserves our best effort! A few months ago Crown & Covenant Publications (that’s right, those Pittsburgh psalm-singing gurus) sent me a review copy of a new edition of The Book of Psalms for Worship. Notwithstanding their current selection of hardcover, softcover, loose-leaf, spiral-bound, large-print, lavender, sage, slim, mini, and slim-mini psalters, this latest release was something unique: a words-only edition (574 pp., Crown & Covenant, 2015). To be honest, I was a bit puzzled. I’m not very familiar with words-only metrical psalters, and I’ve never sung from one in a church service. And being a musician at heart and not a poet, it was hard not to get the feeling that the new book, as it were, took the filling right out of my Oreo. Do-it-yourself psalm-singing. The publisher’s note inside the WOP mentions “its flexibility in matching various tunes with a particular versification.” This means if you don’t like the tune to which a particular psalm is set in the regular Book of Psalms for Worship, you can easily replace it with a different tune of the same meter. A handy metrical index is included in the back. Historical precedent. Although the idea of a songbook without music may strike us as odd, such was the norm just a few centuries ago (followed by the transitional form of the “Dutch door” or “split-leaf” psalter, which Jim introduced here). Even today text-only metrical psalters like the Trinity Psalter are still in print. Ultimately, of course, a text-only psalter reflects the layout of the Book of Psalms itself. The end of verse- and stanza-confusion. When the song leader directs you to sing “verse 2,” do you ever wonder if they mean the second stanza of poetry or literally the second verse of the psalm text? The WOP eliminates this problem by differentiating stanzas with paragraph breaks rather than numerals. Not very useful as a standalone edition. The WOP presumes that its owner, or at least the song leader, also owns a regular copy of The Book of Psalms for Worship from which to obtain the tunes. The WOP is useful by itself only if a user prefers to read a metrical version of the psalms rather than a prose version. Disappointing size savings. I hoped the WOP would be the size of a pocket New Testament or smaller, something on the order of 2” x 3” for ultimate portability. Sadly, it remains substantially larger (though, I guess, more readable) than the words-and-music slim-mini editions. Awkward lyrics have nowhere to hide. A tenet of good psalmody is that the text should be able to stand on its own as clear, smooth, attractive poetry. While much of The Book of Psalms for Worship is excellently versified, it includes more than its share of stilted settings (46C is one example). And with a words-only psalter, there’s no music to mask these blemishes. Whatever deficiencies it may have, I would gladly call The Book of Psalms for Worship one of the best English metrical psalters currently available (and so would Jim, who reviewed the other editions here). The words-only edition is an opportunity for Crown & Covenant to capitalize on the success of an already excellent book. But as I hope even the publishers would admit, these new branches on the growing tree of psalm-singing should never become the final ones, as we continue the quest to sing the Word of God more faithfully and more joyfully. “God gave his church the musical gift of the Psalter,” writes Bradley Johnston at the beginning of his little book 150 Questions about the Psalter (107 pp., Crown & Covenant, 2015). Formatted as a psalm-singing catechism of sorts, Johnston’s book teaches readers to love the Book of Psalms as a gift from God and to learn to shape their devotions and worship by it. After an opening section entitled “Introducing the Psalter,” the book proceeds through six other divisions: “Christ in the Psalter,” “The Arrangement of the Psalter,” “The Content of the Psalter,” “Meditating on the Psalter,” “Singing the Psalter,” and “The Majesty of the Psalter.” Each division answers a variety of questions about the psalms: What is a metrical psalter? Should we regard the Psalter as merely a hymnal for the Old Testament? How do we learn to see Jesus Christ in the Psalter? Why should we sing the Psalms? 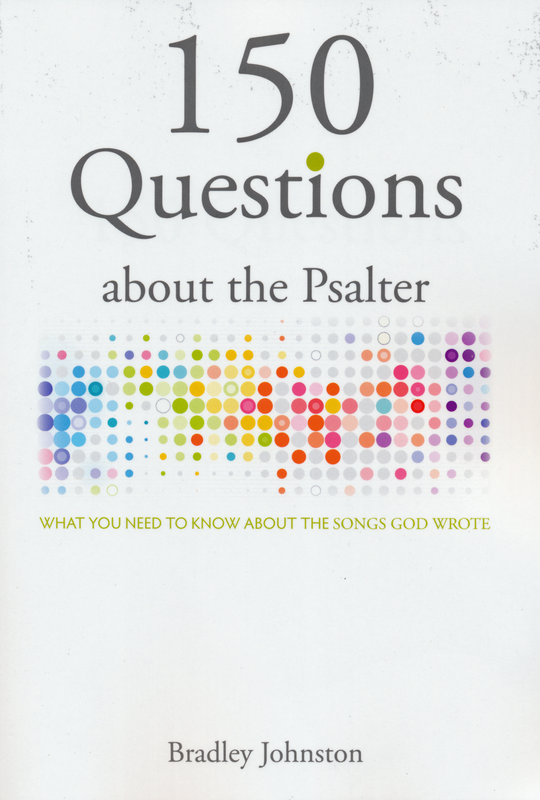 While Johnston’s answers to these questions are overall quite simple and straightforward, 150 Questions also includes almost 100 endnotes with fuller explanations and references to other resources on psalm-singing. Interspersed throughout the text are selected stanzas from a modern metrical psalter, The Book of Psalms for Worship. Several appendices in the back of 150 Questions trace the life of David through the Psalter, the patterns of the imprecatory psalms, an index of psalm references in the New Testament, and much more. It’s a readable, satisfying, and even fun introduction to the riches God has given his Church in the Book of Psalms. Realizing that its author belongs to a denomination that sings only psalms in corporate worship, I feared that 150 Questions would immediately estrange readers from other church traditions by pointedly condemning hymns and other extra-biblical songs. Refreshingly, my fears were unfounded. Johnston chooses to argue for psalms rather than against hymns, making this “psalter catechism” a helpful and attractive resource for readers from a wide variety of worship styles. At the same time, reading a book so saturated with the riches of the Psalter left me painfully aware of the deficiencies of much of the church’s other music—which is probably a good thing. My only quibble with 150 Questions is that some parts of it are very formal in tone, reminiscent of the style of the Westminster Catechisms. While this allows Johnston to provide succinct, precise definitions for the attributes of the Psalter, I tend to think a warmer, slightly more conversational tone would help the book’s winsomeness, especially for newcomers to the practice of psalm-singing. Overall, this is a minor blemish and should not deter the serious reader. If Christians are not careful, psalm-singing, like any other tradition, can quickly become a source of pride and even idol-worship. It’s possible to read 150 Questions as nothing more than a militant defense of one denomination’s historical distinctive. But that’s not the point. Read with a humble, biblically-informed perspective, Johnston’s little book will help believers in every walk of life love the Book of Psalms more. Then be given as a gift to him. May they bless his name throughout the day. O may there be abundant crops of grain! O may the city thrive like grassy fields! As joyous as it is to sing about the bounteous results of Christ’s reign, Psalm 72 often leaves me confused. I understand that its original context is probably a prayer of David or Solomon for Solomon’s kingship, as evidenced by the inscription and v. 20. But many of the blessings invoked in Psalm 72 clearly transcend an individual or even a national focus: “May he have dominion from sea to sea, and from the River to the ends of the earth!” “May people be blessed in him, all nations call him blessed!” (vv. 8, 17 ESV). Such prayers seem to look forward to the coming of a Messiah whose worldwide reign will bring ultimate peace and prosperity. We Christians confess that the Messiah has come and has begun his reign—and yet the blessings of Psalm 72 seem to remain unfulfilled. Will there come a day on this earth when all nations acknowledge Christ as King? Will we see a time when “the righteous flourish, and peace abound[s], till the moon be no more” (v. 7)? If so, why do the circumstances of the world seem to be growing worse rather than better? Lately I’ve been reading David Murray’s recent book Jesus on Every Page: Ten Simple Ways to Seek and Find Christ in the Old Testament. His chapter on the Psalms and the Song of Solomon, entitled “Christ’s Poets,” held a groundbreaking insight for my understanding of such passages. Dr. Murray asks some questions that cut to the heart of our understanding of the psalms: “[D]id the original composers and singers understand what we can with the benefit of New Testament hindsight? Did they see the Messiah in the Psalms to the extent that the New Testament writers did?” He answers that while Old Testament believers could not enjoy the “extraordinary light” we have been granted as a result of Jesus’ death and resurrection and the outpouring of the Holy Spirit, they did trust in a future Messiah, and they knew his message of salvation would be much clearer to future generations. Yes, Dr. Murray would say, Psalm 72 was written with the person and work of Jesus Christ as its preeminent focus. In some ways, we are in a similar position to these first psalm singers when we think ahead to the second coming of Jesus. Many passages in the Old and New Testaments—including the Psalms—predict Jesus’ coming again in great glory to end this world and create a new environment for a renewed people. But while we get the overall outline of what lies ahead, only when these events unfold in detail will we fully understand these scriptures. In the meantime, we look ahead with optimistic faith and sing psalms such as Psalm 72 and 98 with the same inquiring faith that the Old Testament prophets also experienced with reference to the first coming of Jesus [I Peter 1:10-12]. In other words, we may not fully understand all the promises of Psalm 72 and other forward-looking scriptures. But that’s okay. Although Jesus’ birth, death, resurrection, and ascension perfectly fulfilled the messianic promises of the Old Testament, the final consummation of his kingdom according to the Bible’s prophecies is yet to come. The author of Hebrews explains this distinction wonderfully in reference to Psalm 8: “At present, we do not yet see everything in subjection to him. But we see him who for a little while was made lower than the angels, namely Jesus, crowned with glory and honor because of the suffering of death, so that by the grace of God he might taste death for everyone” (Heb. 2:9). So it’s okay for the promises of Psalm 72 to puzzle us. It’s all right to wonder how God will bring about the consummation of the Messiah’s kingdom. As humble, awed worshippers, we need not doubt; rather, we can look forward to the certain fulfillment of this and every other unclear passage. And when we sing, “May his name endure forevermore; may it grow as under shining sun,” we can do so not only in praise but also in anticipatory excitement. Nothing can stop the fact that Jesus is coming again! In the midst of our weighty discussions here on URC Psalmody, there comes a point when a spot of comic relief is inescapably needed. If you’re at all familiar with the psalmody of the Reformed Presbyterian Church of North America (RPCNA), this video just might hit the spot. It’s a tongue-in-cheek promotional infomercial for the Book of Psalms for Worship. URCNA members too should be able to get a chuckle out of the creative hyperbole in these scenarios and testimonials! And thus, with no further comment, I present the Book of Psalms for Worship Infomercial. We hope you'll join us as we discuss music, worship, the psalms, the church, and much more here on URC Psalmody. You can learn about the purpose of this blog here. We look forward to to seeing you in the discussions! With this feature, just enter your email address and you'll receive notifications of new posts on URC Psalmody by email! Goodbye to the Pocke… on Mini-Psalters!